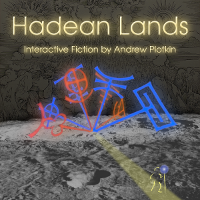 Hadean Lands -- Teaser Scene (Andrew Plotkin; 01-Nov-2010; Web browser). XYZZY Awards 2014: Winner of Best Setting, Best Puzzles, Best Implementation, Best Use of Innovation. Finalist for Best Game. This version was released on Itch.IO; on the official website, using the Humble Store for order processing; and as an iOS app. Cover art teaser. Blog posting, October 2010. Zarf Goes Independent: Hadean Lands. Blog posting, 01 November 2010. Hadean Lands: Interactive Fiction for the iPhone on Kickstarter. Donate during November 2010 to support Zarf not just with the development of this game, but also several yummy technical upgrades. Hadean Lands. Discussion of the Kickstarter news on MetaFilter. Review by David Auerbach at Slate. Hadean Lands is the new Infocom game you’ve always wanted - Review by Jamie Lendino at ExtremeTech. Review by Emily Short at her blog on October 30, 2014. IF Only: Hadean Lands Will Teach You Alchemy - Review by Emily Short at Rock, Paper, Shotgun on June 29, 2016. This review is about the Steam version. This page was last modified on 16 July 2016, at 17:32.